The ultimate power for your home away from home! Recreational vehicles require solid, reliable battery power for house power and other key-off accessory loads. 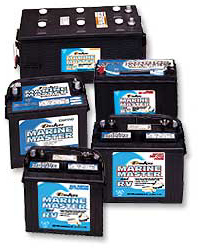 Ordinary automotive batteries aren't designed to handle the deep-discharge accessory power your RV demands. To fully enjoy your travel you need batteries you can depend on...batteries that can power your kitchen appliances, TVs and refrigerators. Whatever living comforts your RV is equipped with, using Deka Marine Master/RV Batteries ensures you maximum power for all your RV equipment, truly making it your home sweet home. For more than fifty years, Deka batteries have set the standard for the absolute highest quality and most reliable performance in the industry. And all Deka Batteries are made in the U.S.A.